To celebrate the 21st anniversary of their debut release, Blur’s classic follow-up album Modern Life Is Rubbish has now been remastered from the original tapes by Frank Arkwright (The Smiths, Arcade Fire, New Order, Joy Division), with the remastering overseen by legendary original producer, Stephen Street. The Modern Life Is Rubbish Special Edition finally unites the non-album single Popscene (which was recorded whilst tracks from the album were being demo’ed) with a Blur studio album. Also included in the accompanying bonus disc are all the Popscene, For Tomorrow and Chemical World b-sides (amongst which are nestled the Visit To Primrose Hill Extended Version of For Tomorrow, a reworked version of Chemical World and a cover of the Rod Stewart classic Maggie May. Completing the bonus disc are the b-sides to The Sunday Sunday Popular Community Song CD, (the official title of the main Sunday Sunday single release), the music-hall style covers of Daisy Bell and Let’s All Go Down The Strand. The Modern Life Is Rubbish Special Edition is housed in a deluxe lift-off lid box with four exclusive Blur artwork postcards and an expanded booklet that includes previously unseen photos and liner notes based on a brand new interview with all the band members. To celebrate the 21st anniversary of their debut release, Blur’s classic follow-up album Modern Life Is Rubbish has now been remastered from the original tapes by Frank Arkwright (The Smiths, Arcade Fire, New Order, Joy Division), with the remastering overseen by legendary original producer, Stephen Street. The Modern Life Is Rubbish Special Edition finally unites the non-album single Popscene (which was recorded whilst tracks from the album were being demo’ed) with a Blur studio album. Also included in the accompanying bonus disc are all the Popscene, For Tomorrow and Chemical World b-sides (amongst which are nestled the Visit To Primrose Hill Extended Version of For Tomorrow, a reworked version of Chemical World and a cover of the Rod Stewart classic Maggie May. Completing the bonus disc are the b-sides to The Sunday Sunday Popular Community Song CD, (the official title of the main Sunday Sunday single release), the music-hall style covers of Daisy Bell and Let’s All Go Down The Strand. 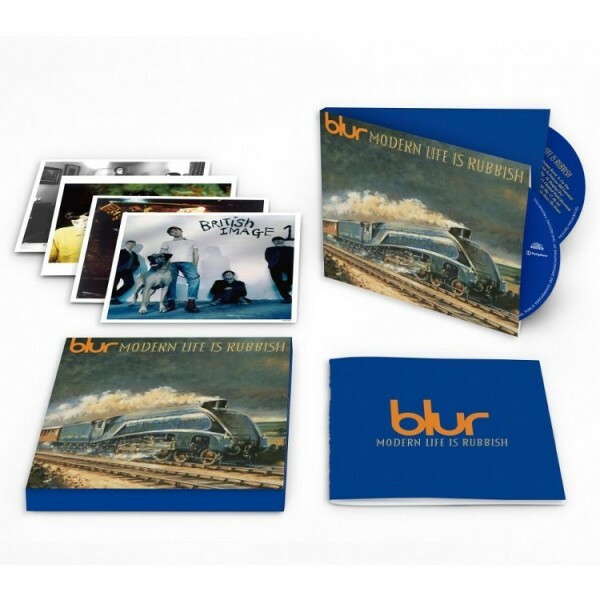 The Modern Life Is Rubbish Special Edition is housed in a deluxe lift-off lid box with four exclusive Blur artwork postcards and an expanded booklet that includes previously unseen photos and liner notes based on a brand new interview with all the band members.